There are few conferences that I hear past attendees rave about more than PHPBenelux. Because of this, I had my expectations set very high when I was invited to speak at PHPBenelux 2015. I was informed that I would be picked up at the airport by Thijs Feryn which made me super happy. 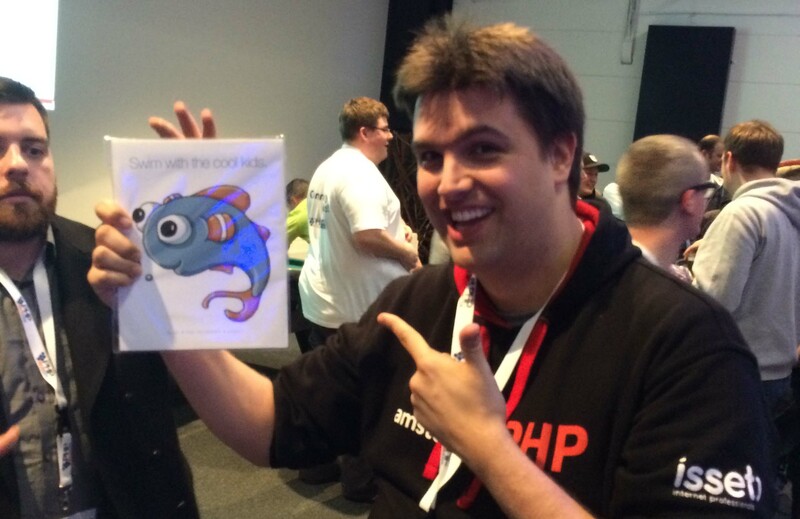 I first met Thijs the very first time I spoke back at Symfony Live 2013 Portland and we met again at SuneshinePHP 2014. I was to be picked up with Igor Wiedler and Josh Butts. Things didn't go quite as planned, though. Instead of Josh Butts, I got to hang out with Igor and Ben Marks at the airport while we waited for Thijs to arrive. It was great to catch up with Igor as I hadn't seen him in quite some time. It wasn't long before our ride arrived, though, and we were taken to the hotel. Setting up at Hotel Ter Elst was quick and I was treated to a few surprises. The PHPBenelux crew had decorated the room with some custom artwork and had left a wide assortment of beer and chocolate. I'm a little ashamed to say that most of the chocolate did not last more than an hour or so. Against recommendations by pretty much everyone, I decided to take a quick nap. With the timezone differences and an eight hour layover in Chicago (planned; don't ask) I was extremely tired. I still wanted to brush up on my talks and I was already anxious about the speaker dinner, but I felt I needed to get at least a little sleep. I ended up getting just an hour of sleep in before I had to get up for the big show. I can say "the big show," now, knowing what we had in store. "The big show" turned out to be the big theme for PHPBenelux for 2015. I should have known by the artwork in the room. I ended up seated next to @coderabbi on the bus and had a great time catching up with him. I got to hear him talk in more detail about his Wisdom as a Service World Tour which was a treat. He's got a busy schedule ahead of him! We arrived at the location after about half an hour of driving. It wasn't clear where we were being taken but it seemed like we were headed in the direction of some very tall lighted poles. As we got closer it became clear that it was a giant circus tent. Lights. Music. Clowns. The whole works. On entering the tent I got to talk with Frank de Jonge for a bit. That was a lot of fun! After we had been talking for a few minutes, the PHPBenelux crew thanked us, told us that they wanted us to have a fun time, and we were instructed to sit. I ended up sitting at a table with Anthony Ferrara and got to catch up with him a bit. I'm not going to lie. I loved the show. I haven't been to anything like it before. It was just so totally unexpected. I enjoyed the food as well!Three courses were served for dinner and each preceded by an act directly related to the act of serving or preparation of the course. I did feel myself squirming in my seat a bit at some of the humor. I didn't know if I should just write it off as cultural differences in "what is acceptable" or not? For myself, I decided not to clap for anything that I felt was crossing the line. The whole thing felt so surreal and I did not expect any of it. Anxiety aside, I had a great time! Day 1 involved me getting up far later than I had expected. I got to the breakfast nook in time to have breakfast with Benjamin Eberlei. We were joined by Matthias Noback not long after. The breakfast at Ter Elst was great! I had hoped that I would be able to check out Igor and Anthony talk about Cute Little Interpreters but it was too late for that. Back to the room to do a little more preparation for the day. After I launched ddd.io earlier this year I had an idea to create unofficial Domain-Driven Design tracks for some of the conferences I end up attending. When I saw the schedule for PHPBenelux I decided it would make a great trial run! By publishing my unofficial PHPBenelux Domain-Driven Design track I had committed myself to something new: actually going to some of the talks at a conference and actually paying attention. This might seem strange to some, but I know several people who attend conferences solely for the hallway track. I would say in my case it is usually a mix between hallway track and talk preparation that keeps me from attending too many talks and the talks that I do attend are usually just for fun so I rarely take notes. As it turned out, the only talks I ended up attending were the talks on my list. I think that you could safely say that had this list not been written I would have attended far fewer talks. In my defense, I had hoped to watch the keynote by @coderabbi. However, the main hall was filled beyond capacity. I spotted two seats available, total, but when I got to them I saw they were taped off with yellow tape that I could only assume meant danger or construction. Either way, I decided to back off and returned to my room. I had been fortunate enough to see "Talmudic Maxims to Maximize Your Growth as a Software Developer" at php[world] so I tell myself that I didn't "miss" anything. The first talk I attended was Task Based UIs by Stijn Vannieuwenhuyse (@stijnvnh). You can read my review for this talk on ddd.io. After this talk I met @tinydroptest2. He also happened to be a That Podcast listener! I believe this may be the first time I've met someone in person who has listened to That Podcast without me knowing about them (or the fact that they were a listener) in advance. Achievement unlocked! I ended up hiding out after the Task Based UIs talk to finish getting prepared for my talk on Stack. The first time I ran into Jordi Boggiano was in the lobby of the hotel as I was on my way to my talk. I wasn't in any position to stop and chat and I could tell that he was thinking, "What, you couldn't even stop to say hi?" as I merely waved on my way through the door. We laughed about it later and he said I ended up figuring out I was on my way to my talk. I had mixed feelings going into the Stack talk. So much has changed since I was pitching this talk at the end of last year. Between Symfony 3 on the horizon and PSR-7 becoming more of a reality every day, the future of Stack is a little less certain than it once was. I've always seen Stack as a reference implementation of what a generic PHP Middleware solution would look like. It was never going to be able to truly break out of the Symfony ecosystem but within that ecosystem it could help show how powerful sharing code at the HTTP level could be. I think in that regard Stack has succeeded. I was blown away by the number of people who raised their hands when I asked who had used Stack before. Anywhere from 1/3 to 1/2 of the people in the room! I was shocked. I know that Stack has had some buzz in the past but I had never gotten the impression that it was used by so many people. I was also blown away by the feedback I received. By most accounts the talk was well received! I felt the talk went well, even with the 20 minutes of talking about a nebulous future, so I was happy to hear that other people felt the same. I met several people after the talk but my typical post-talk fog was in full effect. The only person I remember seeing for sure was Willem-Jan. I also had something else distracting me after my talk. I had decided to kick off two art projects to coincide with attending PHPBenelux. Hurray for free art raffles! 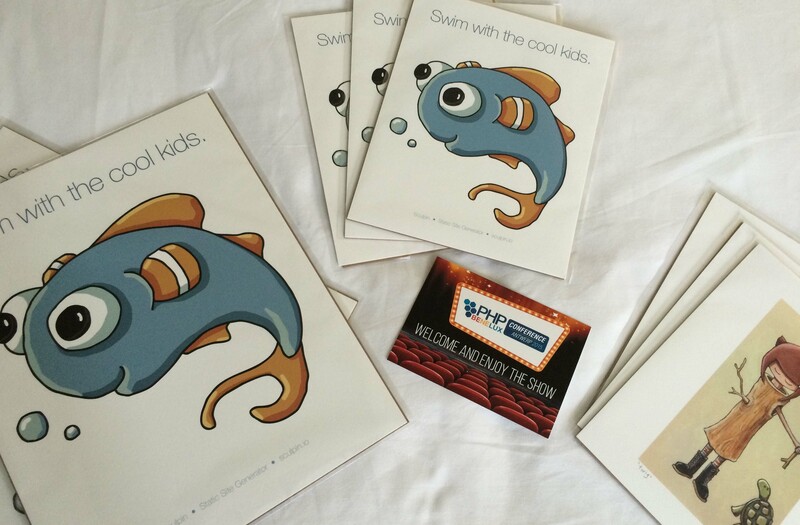 I brought several of the new "swim with the cool kids" Sculpin art prints along with the first of the #ossart prints "twig" to give away to people at PHPBenelux. The winners were announced right before my talks and the winners were asked to come find me as soon as they could after my talk. Stephan Hochdörfer won the very first copy of "twig" and Youssef Aani won the very first 11"x14" Sculpin print. Sadly, I was never able to connect with Youssef so that one came back home with me. 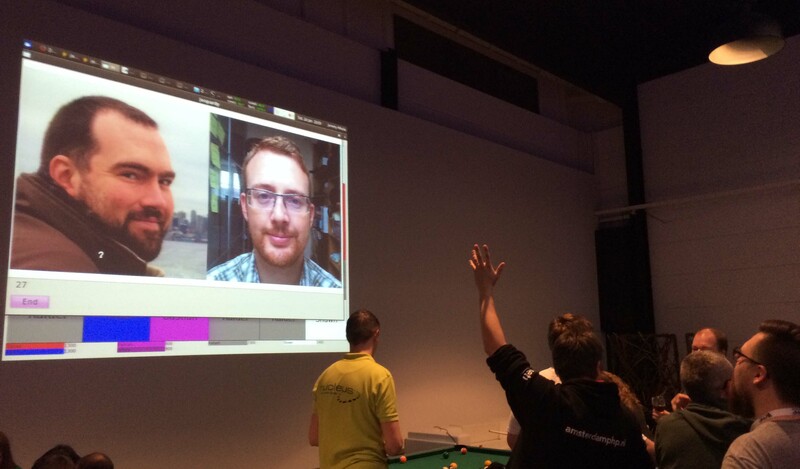 It was a fun thing to do and I hope to be able to do this at future conferences as well! It does, however, add to the stress and anxiety that is already associated with speaking so I may try to find another way to do this in the future. It was at this point that I discovered Peter Decuyper was tweeting his sketchnotes of the talks he was attending. Peter found me later and I got to meet him in person. 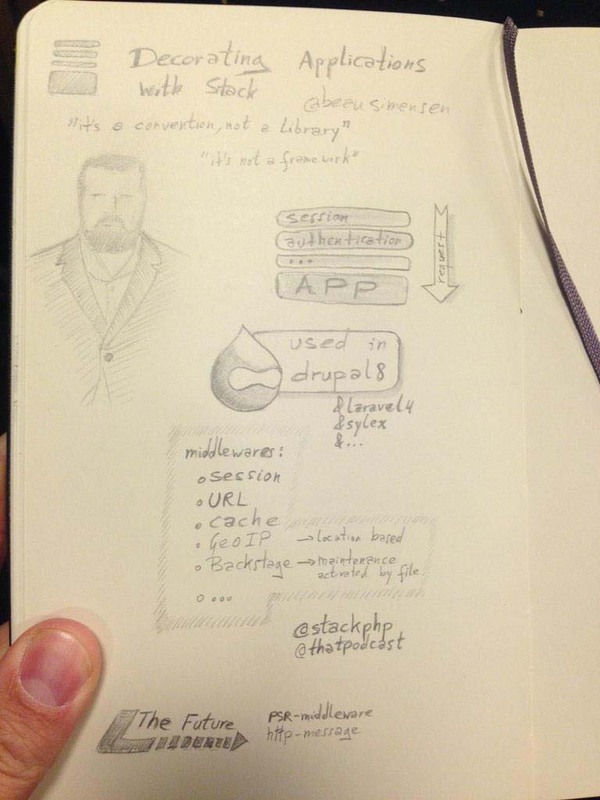 We ended up going to many of the same talks so I was able to publish his sketchnotes for all but one of the ddd.io talks! Immediately following my Stack talk was the next of the ddd.io talks sat in on: A Series of Fortunate Events by Matthias Noback (@matthiasnoback). This talk wasn't so much about DDD but that was expected. You can read my review for this talk on ddd.io. After his talk, I had a chance to talk to Matthias and received a copy of his new book, Principles of Package Design! Thanks Matthias! I was a little late getting to the social so the line for the fries was quite long. I did get to say hi to Mathias Verraes who had only just arrived at the conference. It had gotten quite cold so I decided to head back to the room again to get my coat, hat, and gloves. By the time I got back the line hadn't gotten any shorter. The fries and the "freck-deegle" were well worth the wait. I ended up getting to spend some time talking with Jeroen van Dijk which was nice. I think I ended up talking to a bunch of other people as well but by that time I was into the social overload mode and ready to relax. I wish I enjoyed these social things more but it can be pretty difficult for me sometimes. Day 2 started earlier (the morning of day 1 was dedicated to tutorials) so I needed to get out early. I finally ran into my mentee Beth Tucker Long at breakfast. She beat me to Belgium by half a day but due to a bug she picked up on her flight I hadn't run into her yet. It was nice to catch up with her even though we live in the same town. There are some stretches that we end up seeing each other more away at conferences than we do in Madison. I also had a chance to talk to @coderabbi some more during breakfast. Jeremy Mikola sat down with him later and I learned more about their joint efforts around #WurstCon 2015 Euro Trip Edition. Jeremy agreed to accept a "twig" print to give away at Cologne for the Symfony portion of #WurstCon and Sculpin print to give away during PHPJeopardy during PHPBenelux! The first talk of the day was Migrating to Domain-Driven Design by Anatoly Pulyaevskiy (@pulyaevskiy). You can read my review for this talk on ddd.io. The room was packed for both this talk and the other Domain-Driven Design-ish talk on Task Based UIs. The people attending PHPBenelux definitely seemed to be interested in DDD this year! The next talk I attended was Small Uncontrolled Experiments by Mathias Verraes (@mathiasverraes). You can read my review for this talk on ddd.io. I had lunch quickly and then hurried back to my room to prepare for my last talk. As happens more often than not, I had a talk that was in the last regular talk slot of the conference. This meant I had plenty of time to prepare and take a quick nap to refresh. If I have one regret... wait, two. If I have two regrets, it would be that I didn't take a longer nap (I think I needed it as I had a cold coming on) and that I missed the break right before my talk. I saw the pics after the fact and whatever those sweets were looked quite tasty. I hurried to get to the room to setup for my talk. I had checked the lighting situation earlier and discovered that I wasn't going to be able to pull off the white-on-black slides like I had hoped. Fortunately, because I have started using Deckset it wasn't a big deal to change to black-on-white. Having done this several hours before my talk meant I wasn't stressed about this right before my talk. I'm glad I did that right as it would have been easy to just assume it was going to work and then have people not be able to read the slides. It sure would have looked sharp in a perfect world, though. Of the two talks selected I had the highest expectations for my Domain-Driven Design talk, "Say What? Ubiquitous Language and You!" You can read my review for this talk on ddd.io. Unlike my Stack talk, which had been given at least two other times in the past, this was the first time I've given this talk. I've found that either I nail a talk the first time around or I learn a lot about what was missing or needs to be changed around. From my perspective I think the talk went well and was delivered as expected. The only thing I was a little concerned with was that it came in shorter than I would have liked. I know it is common for talks to end up being delivered faster in front of a real audience but this seemed even shorter than usual. Still, with the amount of questions and discussion that happened after the main talk was delivered it ended up going as long as needed. From the perspective of the audience I think the talk was only "okay." The most common criticism I've received was that there was a severe lack of examples. While this is a fair critique this was actually an intentional decision on my part. I wanted to see how far I could push this topic without giving detailed concrete examples. It was an experiment that I think failed. I will find some way for this talk to have more examples in the future. All in all I was happy with how things went with this talk but felt that there was much I could do to tighten up the experience. I'm hoping I'll have the chance to give this talk at more conferences this year or next year! After the talk I had a chance to talk to a few people including Ross Tuck. I also got another chance to meet up with both @tinydroptest2 and Cristian Toffanin. They both won the second day's Sculpin and "twig" prints. Gunther Groenewege won a Sculpin print as well! We had to rush to the closing at that point which was the usual raffle/see you next year sorta thing. Except it wasn't. After a few false starts, we were treated to a magic show to end the main part of PHPBenelux 2015! There was another social to attend and it seemed to be a little more laid back than the first night's event. People were tired and many had already left. I stayed longer than I probably would have under normal circumstances because I wanted to be around for PHPJeopardy. I had heard about this before, but That Podcast has made it into the questions on a few occasions! When I saw a category that looked somewhat podcast related I knew I had to keep my camera ready so I could get this shot! I met and got to see a bunch of people that I know I've forgotten to mention (like Erika Heidi Reinaldo, Mike Simonson, Michelangelo van Dam, the list goes on...) but I guess that is what happens when you aren't able to write a conference review until two weeks later! I very much enjoyed my PHPBenelux experience and I'm extremely happy that I was able to be a part of this conference! It is clear to me that the team goes above and beyond to try and impress and make sure that their attendees, speakers, and sponsors have a wonderful time.